Firewise USA® is a national recognition program through the National Fire Protection Association (NFPA) that emphasizes homeowner responsibility and community participation in wildfire home safety. It encourages local solutions for reducing wildfire risk by involving homeowners, community leaders, planners, developers, firefighters, and others in the effort to protect people and property from the risk of wildfire. 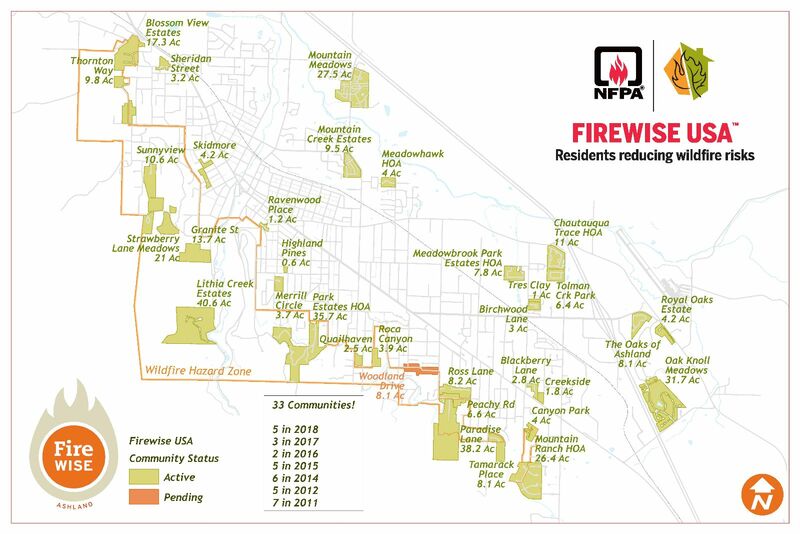 To save lives and property from wildfire, the NFPA Firewise USA program teaches people how to adapt to living with wildfire and encourages neighbors to work together and take action now to prevent losses. neighborhoods within the city limits. Ashland's first 7 communities were created in 2011 and the program has taken off since then. Complete a community assessment and create an action plan that identifies agreed-upon achievable solutions to be implemented by the community. This can be done by the City's Fire Adapted Communities Coordinator. program and tracks its progress. Observe a Firewise Clean Up Day each year that is dedicated to a local project. Invest a minimum of $24.14 per dwelling unit annually in local Firewise projects. See examples here! Submit an annual online report that documents continuing compliance with the program. Visit firewise.org, or call Ashland Fire & Rescue and ask for more information about how your neighborhood can become Firewise USA®! to learn more about home ignition zones and what you can do to better protect your home and property from wildfire.